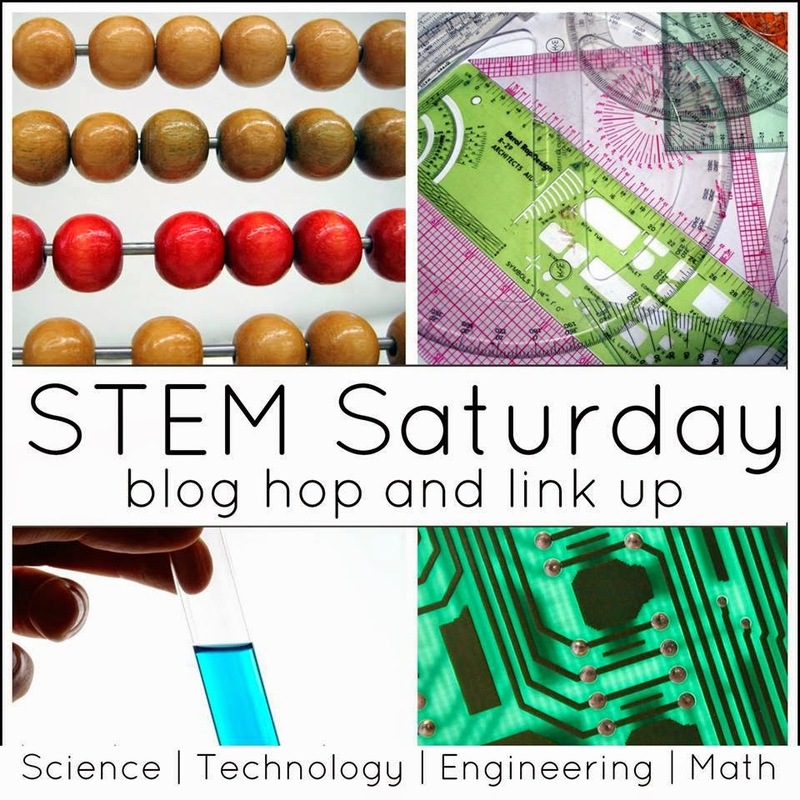 Today I am giving you two science experiments for the price of one. You may even end up surprised at the end like I was. First we are going to do a fun sink or float experiment that will teach the kids all about density. Then we will transform the density tube into a beautiful lava lamp that is sure to delight even the oldest Science Kiddos. This is Lava Lamp, Deluxe Edition. Safety Concerns: None. All ingredients are edible,though if you choose small objects for the Sink or Float portion of the experiment you will want to make sure they aren’t choking hazards. Several small objects from around the house. Ideas may include LEGO minifigures, buttons, glitter, beads, rocks, feathers, foam blocks, small pieces of ribbon, etc. Fill your clear container about half way with water. Add food coloring, if desired. 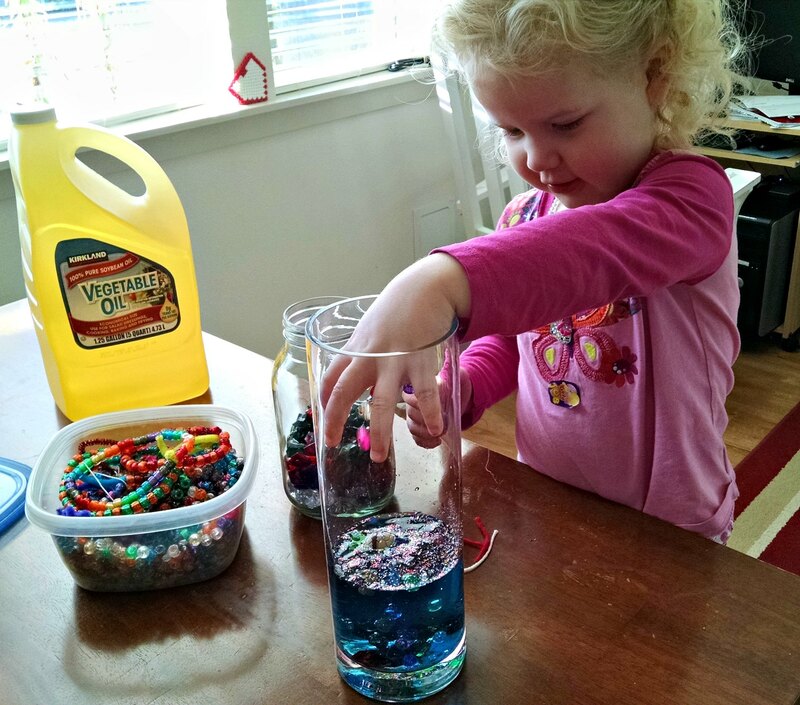 Tell your child you are going to do an experiment to see which objects sink and which ones float in the water. Hold up each item and ask him/her if the object will sink or float. This is the child’s hypothesis. Now have your child carefully drop each object into the water. Was their hypothesis correct? In my experience kids want to repeat this activity over and over again. That is fantastic!! Children learn through repetition, so go ahead and encourage it. 🙂 Once your child is done doing Sink or Float, save the container of water with all the sunken/floating objects in it to use for making a lava lamp! 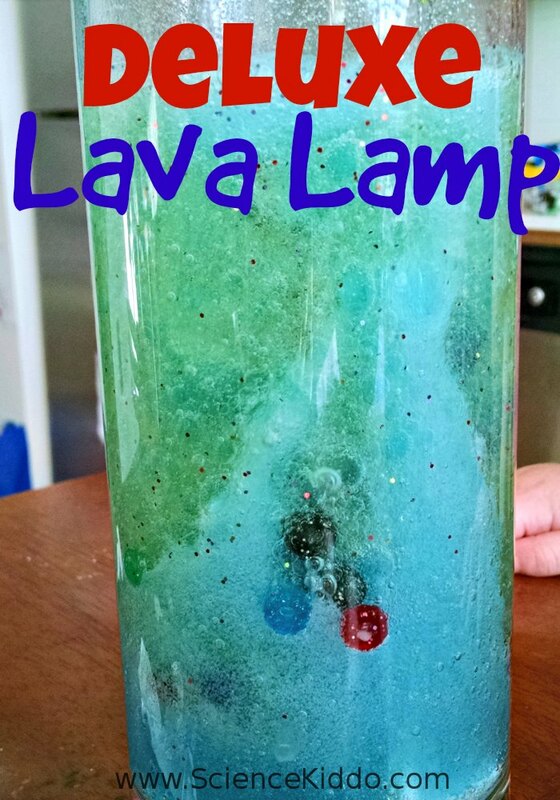 Are you ready to make your own deluxe lava lamp using the brilliance of chemistry and some easy-to-find household materials? Let’s get started! Add food coloring to the water if you haven’t already. It’s best to have a darker color so you can really see the water “bubbling” through the oil. Fill your bottle the rest of the way with oil, being careful to leave at least 2 inches empty at the top. Drop in one or more Alka-Seltzer tablets and watch what happens! The chemical reaction happening with the Alka-Seltzer tablets is exactly what we did to make our Film Canister Rockets lift off! I explained the entire reaction in that article if you are interested. So why does the oil sit on top of the water when you make a lava lamp? We explored this question when we did our Color Bombs experiment. Oil and water don’t mix because they are made of different kinds of chemical bonds. Oil is nonpolar while water is polar, which means they will never mix, even when shaken extremely hard. Food coloring dissolves in water (since it is water-based and polar as well), which leaves the oil sitting on top by itself. When you drop an Alka-Seltzer tablet into the bottle, it only reacts in the water layer. Carbon dioxide bubbles are released as it reacts, causing the fun effect of colored water bubbling up through the oil, and then settling back down again. This reaction will occur for as long as you feed it fresh Alka-Seltzer tablets. After all the tablets have been used and the mixture stops bubbling, you can even store your lava lamp indefinitely for later use. 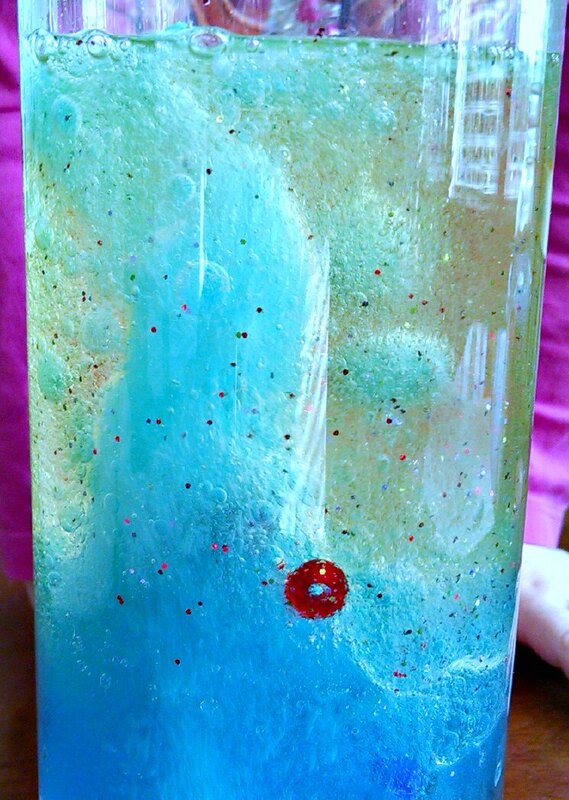 I loved making a lava lamp with little treasures inside of it. 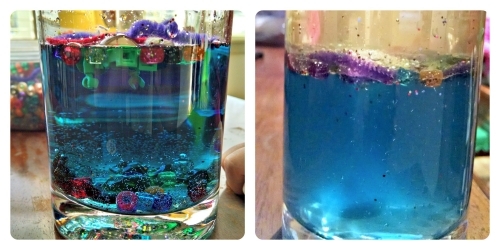 Watching our LEGO man, buttons, beads, and glitter bubble up and down the tube added just a little bit of extra magic. Now I have a question for YOU! You can see in the pictures that many of the objects we added to our lava lamp sunk to the bottom in the beginning, but after we added several Alka-Seltzer tablets all but one button floated at the top of the water layer. WHY? Leave a comment with your answer! The density changes I guess! Lemme see where I can get these tablets, as it seems fairly easy to perform this science activity, thanks! Ding ding, you are right! When the tablets react in water they produce carbon dioxide bubbles (this is what causes the fun fizzy effect) and a salt. That salt changes the density of the water, making the objects float! It was totally a surprise for me that took me a few days to figure out, actually 🙂 Thanks for stopping by!